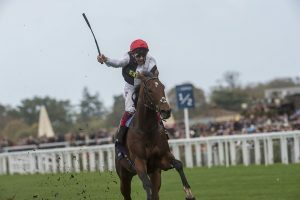 QIPCO British Champions Day at Ascot lived up to its name with a host of outstanding performances, none more so than Anthony Oppenheimer’s homebred colt Cracksman in the headline Champion Stakes. Racing over ten furlongs for the first time since his seasonal debut in the Derby Trial at Epsom in April, Cracksman was sent off 13-8 favourite against nine rivals and he didn’t disappoint his followers. Settled behind the leaders by Frankie Dettori, the three-year-old was sent on with two furlongs to run and the race was quickly over as a contest. Cracksman used his awesome stride to power through the rain-softened turf, romping home seven lengths clear of Poet’s Word, with Highland Reel a neck away in third. The style of victory was reminiscent of Cracksman’s father Frankel, who ended his unbeaten 14-race career with victory in the 2012 Champion Stakes. It was a first Group 1 success for Cracksman and indeed his sire in Europe. Champions Day got underway with a thrilling finish to the Group 2 Long Distance Cup, as Ryan Moore conjured a late burst from Order Of St George to deny Jessica Harrington’s outsider Torcedor. Trainer Aidan O’Brien was soon celebrating another Group 1 triumph – equalling the record 25 top-level wins in a calendar year achieved by the late Bobby Frankel – when Hydrangea relished the step up to 12 furlongs to take the Fillies and Mares Stakes. Dean Ivory left Ascot a happy man after Tony Bloom’s Librisa Breeze, so often a hostage to fortune with his come-from-behind style of racing, put it all together in the Champions Sprint, running on strongest of all to defeat Tasleet and record a first Group 1 for himself and his trainer. Cracksman’s trainer John Gosden enjoyed a Group 1 double, as filly Persuasive, owned by Cheveley Park Stud, got the better of favourite Ribchester in the Queen Elizabeth Stakes under the other man-of-the-moment, Frankie Dettori. The closing Balmoral Handicap saw 20 runners go the post but the market got it right as 3-1 favourite Lord Glitters, representing the David O’Meara-Danny Tudhope partnership, saw off the gallant GM Hopkins by a neck. 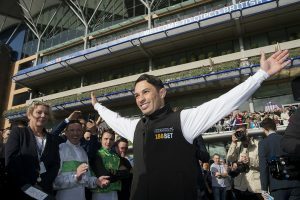 Silvestre de Sousa won this year’s jockeys’ championship at a canter and the Brazilian, enjoying his second title, was crowned on British Champions Day with his family in attendance.